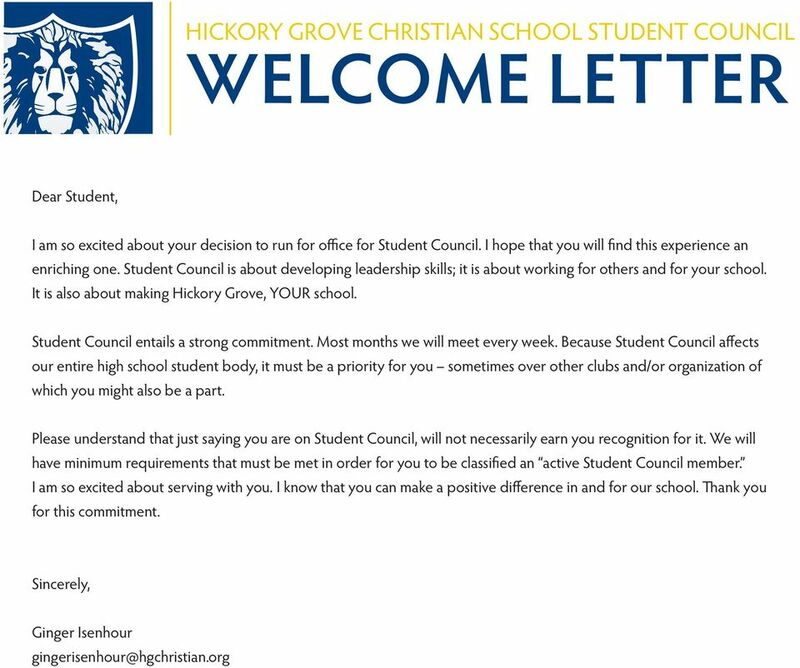 Download "STUDENT COUNCIL ELECTION PACKET"
3 REQUIREMENTS Student Name Seeking office of REQUIREMENTS: Student must have and maintain a minimum of 2.5 GPA to run for a SC position and cannot have an average below 77 in any class. 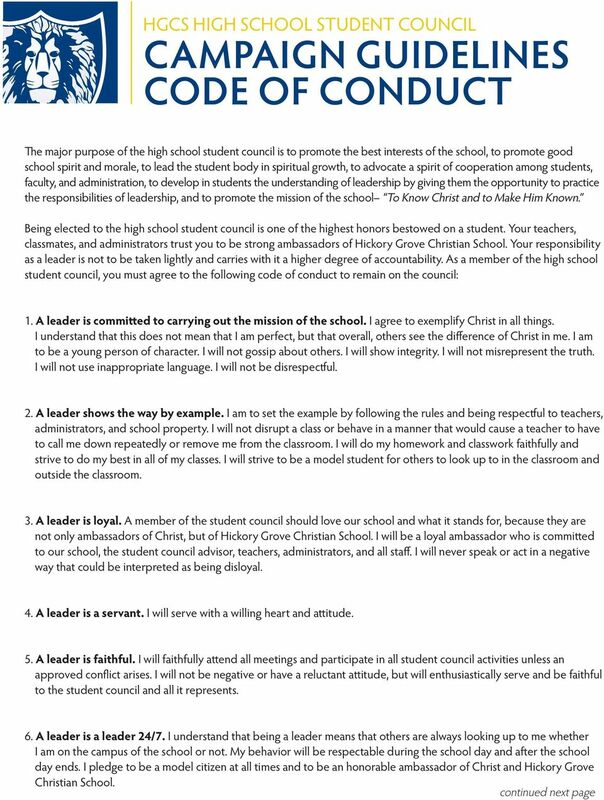 Student must maintain a high level of class/school behavior without issues of a disciplinarian nature. 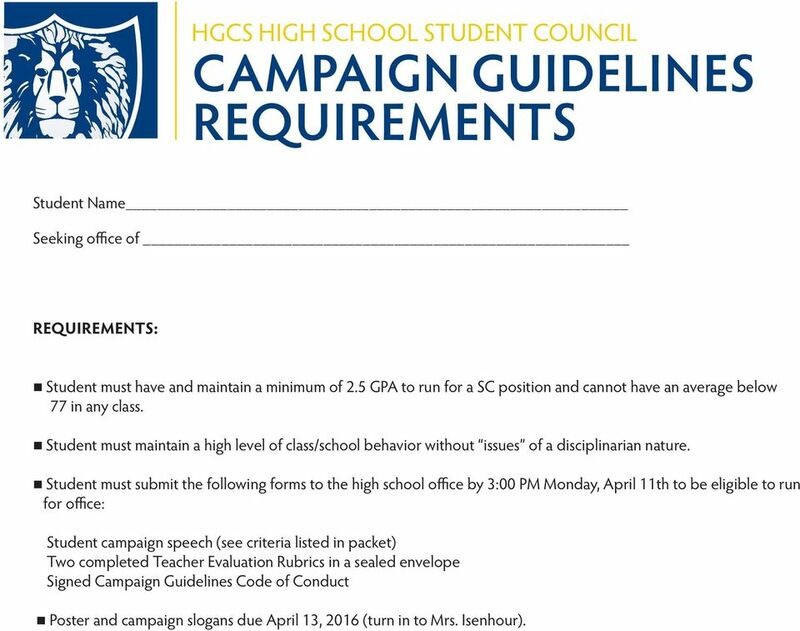 Student must submit the following forms to the high school office by 3:00 PM Monday, April 11th to be eligible to run for office: Student campaign speech (see criteria listed in packet) Two completed Teacher Evaluation Rubrics in a sealed envelope Signed Campaign Guidelines Code of Conduct Poster and campaign slogans due April 13, 2016 (turn in to Mrs. Isenhour). 4 SPEECHES & ELECTION WHEN: Election Day will be announced when determined by administration. All candidates should be prepared to give a 2-3 minute speech in front of the student body. REQUIRED DRESS: Honor Dress Code is required if/when speeches are given. SPEECHES: Student must submit a typed speech that responds to the following questions: Why do you want to run for Student Council? (Be positive and don t make empty promises that you may not be able to keep) What does it mean to exhibit Christian leadership? What leadership skills do you possess? What are your plans for a community outreach/service project that SC could perform in the following school year? Make sure comments are positive and focus on your qualities and leadership skills. Do not make empty promises that you may not be able to keep. Do NOT speak negatively about our school or an opponent. Mrs. Isenhour and Mrs. Royal will read the speeches to ensure the message is appropriate. 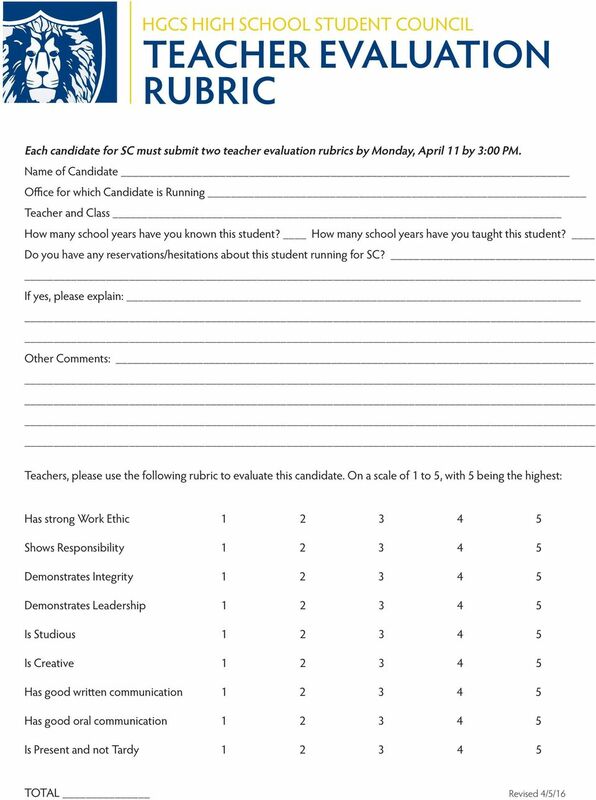 Candidates will be notified if their speech is unacceptable and given a chance to make the needed corrections. Students are expected to adhere to the accepted speech that was turned in for approval. The speech given does not have to be verbatim, but the spirit of the message cannot be altered without prior approval from Mrs. Isenhour. 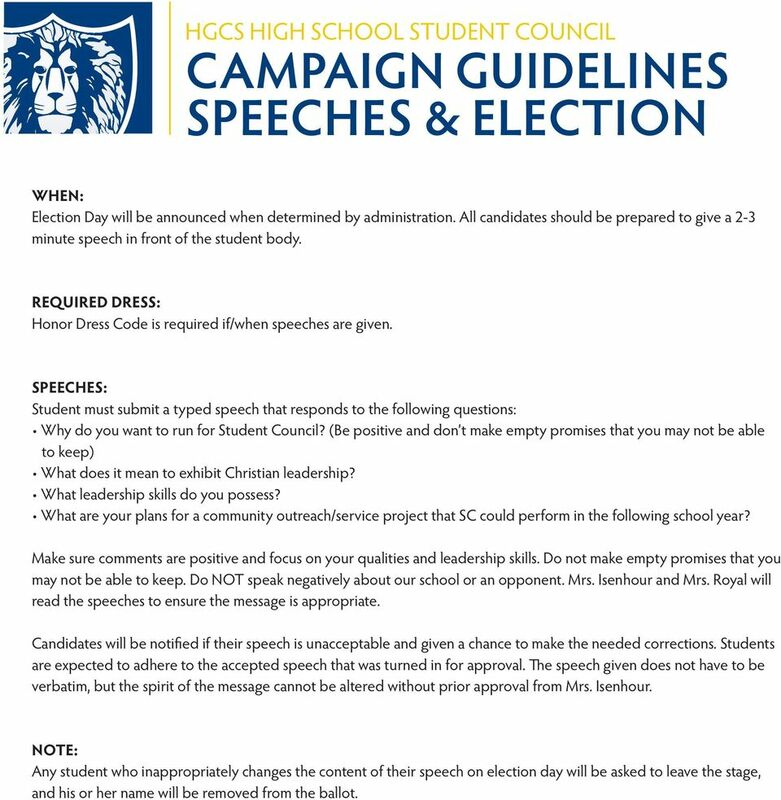 NOTE: Any student who inappropriately changes the content of their speech on election day will be asked to leave the stage, and his or her name will be removed from the ballot. 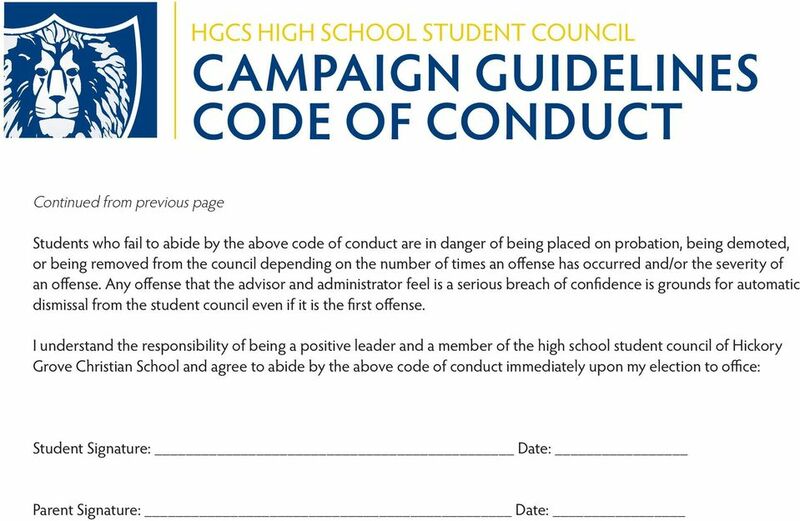 5 POSTERS & CAMPAIGNING HGCS believes that a Christ-honoring campaign is a positive campaign. Slogans on posters are to be positive. Slogans should promote the candidate running for office. Do not make empty promises that you may not be able to keep and make sure your word is honorable in all things. 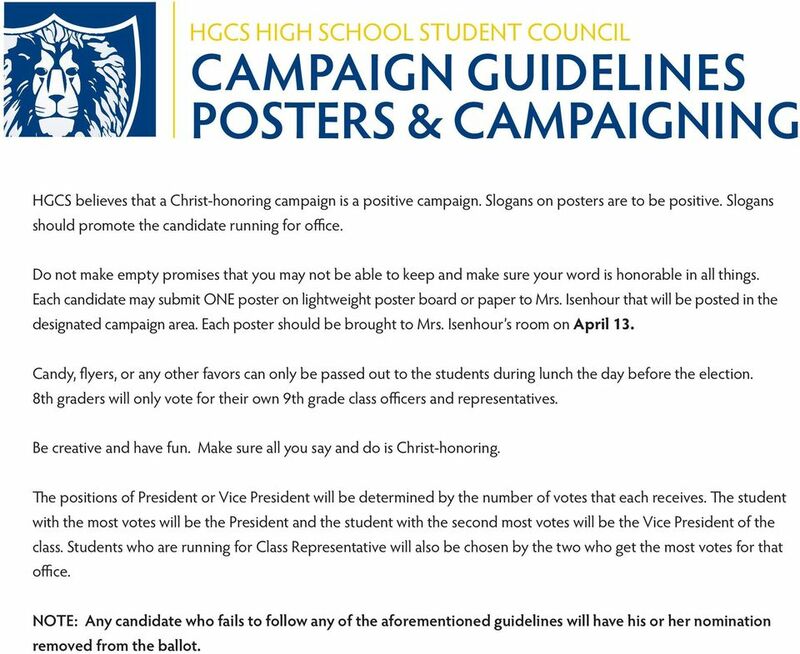 Each candidate may submit ONE poster on lightweight poster board or paper to Mrs. Isenhour that will be posted in the designated campaign area. Each poster should be brought to Mrs. Isenhour s room on April 13. Candy, flyers, or any other favors can only be passed out to the students during lunch the day before the election. 8th graders will only vote for their own 9th grade class officers and representatives. Be creative and have fun. Make sure all you say and do is Christ-honoring. The positions of President or Vice President will be determined by the number of votes that each receives. The student with the most votes will be the President and the student with the second most votes will be the Vice President of the class. Students who are running for Class Representative will also be chosen by the two who get the most votes for that office. NOTE: Any candidate who fails to follow any of the aforementioned guidelines will have his or her nomination removed from the ballot. Program Dates: July 2 July 29, 2017 Postmark Deadline: March 1, 2017 If needed, transportation will be provided to campus. Page: 1 Application for Participation High School Intensive Urban Internship 2008 Dear Student: CSM has a special opportunity in summer 2008 for a select group high school students. Are you one of them? Ridgewater College Student-Athlete Handbook and the Policies and Procedures Manual of the Athletic Department. Ridgewater College Student-Athlete Handbook and the Policies and Procedures Manual of the Athletic Department. PHILOSOPHY Membership on an athletic team at Ridgewater College is considered a privilege. A.M.D.G. March Admissions preference will be given to boys and girls who are recommended to CCPSP by their school principal. 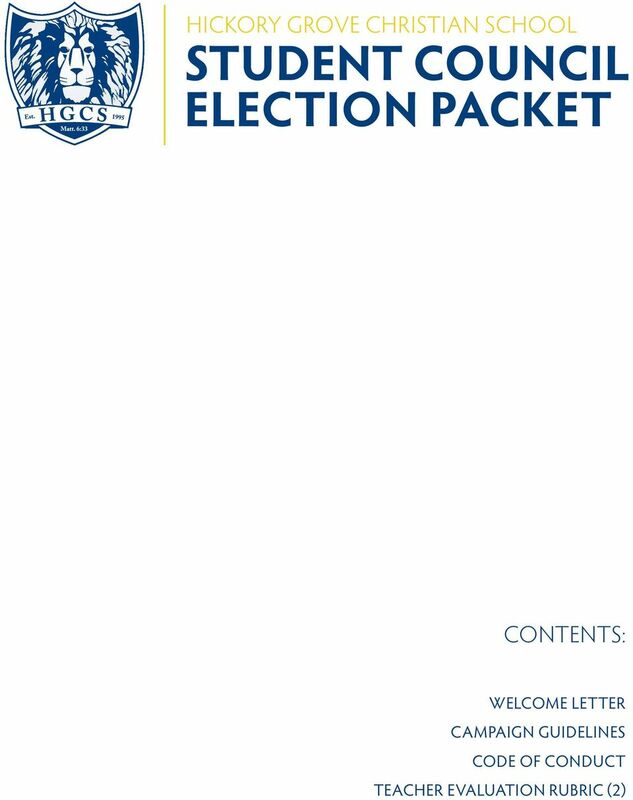 CITY COLLEGE OF SAN FRANCISCO PAGE 2 CITY COLLEGE OF SAN FRANCISCO DATE: MAY 11 & 12, 2016 ASC VOTERS GUIDE ACADEMIC YEAR 2015-2016 THIS ELECTION WILL BE RUN IN THE MOST FAIR AND ETHICAL MANNER POSSILE. 1 CHAPTER ONE BY-LAWS of the STUDENT GOVERNMENT ASSOCIATION Enacted September 30, 2010 Most Recent Edition as of April 8, 2011 CONTENTS ARTICLE I. STUDENT GOVERNMENT OFFICIALS & BODIES 1-1.1. Definitions.